The newest book from Wendy Wax hit the shelves this week (June 26, 2012)! you’re headed out on vacation, or just looking for a great weekend read, you’d better be on your way to buy this book. Ocean Beach is a sequel to Ten Beach Road (reviewed here), but you can easily pick this one up and read as a stand-alone. 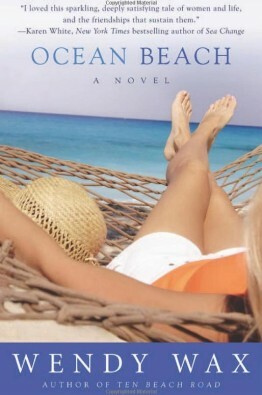 Set in ultra-hot South Beach, the book brings together the wonderful cast of Ten Beach Road once again. They’re paired with a new project house and a new business venture. The ladies have a fledgling reality TV show featuring their newfound talents. Unlike their previous restoration, the women don’t own this house. It comes as a package deal with its owner. Max is retired widowed comedian who used to roll with the likes of Lucy and Desi, and George and Gracie. Max’s career is over. His wife is gone and his only child has been missing since the 1960s. But he doesn’t complain. He brings the book more spark than the Fourth of July. The women are as intrigued by Max’s past as they are the house. And Max is more than willing to reminisce. As in Ten Beach Road, financial and emotional futures are at stake for Nicole, Maddie, Avery, Deirdra, and Maddie’s daughter, Kyra. Everything hangs on the success of the reality show. The women struggle to keep their personal lives intact while they tear down walls and rebuild a magnificent piece of South Beach architecture. You’ll laugh, you’ll worry, and you’ll cry as Max and the women repair his house complete their respective journeys.